Included here are all printed works that do not fall under any of the other print categories. If similar submissions from more than 15 different participants are received, a new category will automatically be created. •Design that fits under any other category. The design must have been published in the previous calendar year, and can’t be self-promotional. Save image files and/or digital photos of the design as JPG (3600 x 1536 pixels RGB, 72 dpi). Depending on the nature of the implementation, requirements might vary. In case of doubt, please contact European Design for further instructions. Please send one physical sample of the design when possible. In case of large-sized applications, send printed photos mounted on A3 or A4 foam boards. Mark them on the reverse side with your submission code. 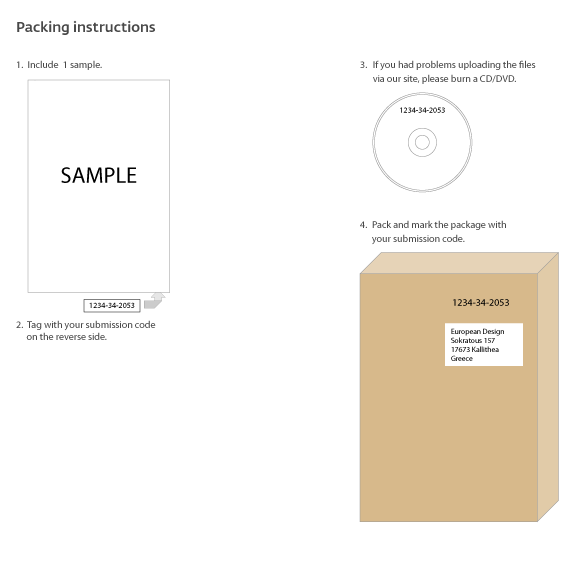 Place the sample/printouts (if applicable) and any other samples you might deem necessary in an envelope and post it to European Design's Greek office (to arrive no later than 8 March).